U.S. President Donald Trump walks during the welcoming ceremony at the start of a NATO summit at the Alliance’s headquarters in Brussels, Belgium, July 11, 2018. Sharp divisions over who should pay for Europe's defense have overshadowed the opening of the NATO summit in Brussels, after U.S. President Donald Trump accused European allies of taking advantage of American taxpayers. "President Trump wants to see our allies share more of the burden and at a very minimum meet their already stated obligations,"said Sanders. 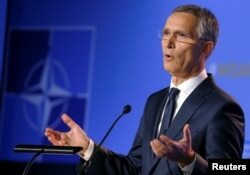 NATO Secretary-General Jens Stoltenberg gestures as he holds a news conference during the NATO summit in Brussels, Belgium, July 11, 2018. 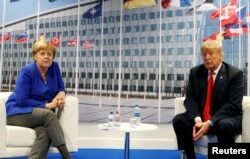 U.S. President Donald Trump meets with German Chancellor Angela Merkel during the NATO summit in Brussels, Belgium, July 11, 2018. President Donald Trump's travels this week include Brussels, Belgium, England, Scotland and Helsinki, Finland.